Folder tree view consists of two parts - hierarchical folder view and selected folder details. Folder hierarchy starts from profile root folder. Expand folders to see its subfolders. Select folder to view its (folder) details. Selected folder details - full path, owner, last modified date, is inheriting permissions from parent folder and current filter state. View all folder permissions or switch to subfolder view to see all subfolders. Selected permission entry security principal details - display name, account name, description, Security Identifier (SID), account type, manager, department and job title. 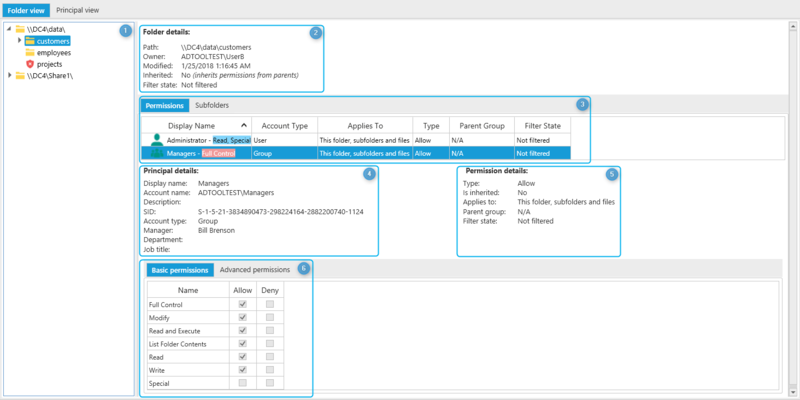 Selected permission entry details - type, is inherited from parent folder, applies to scope, parent group name and current filter state. See selected permissions rights in two views - basic permissions and advanced permissions.